On Saturday, December 5, 2015, the “South Florida Exotic Car ‘TOY RALLY’, to benefit Toys for Tots celebrated its 10 year anniversary, as it ‘took to the streets’ for charity. This event is one of the largest processions of exotic cars and one of the most anticipated exotic car events in the country! Hundreds of exotic cars were driven from the beautiful Diplomat Golf & Tennis Club, up to the amazing Goodyear Airship Base, home of the Goodyear Blimp. The caravan of exotic cars stretched miles long and the 2015 Toy Rally broke some amazing records. It contained over $50 million in exotic cars, it saw record attendance, and it included a huge mountain of toys (over 2,100 toys)! Ugo Colombo’s THE COLLECTION was proud to be a sponsor for this event. Another year, and another success for this important cause! 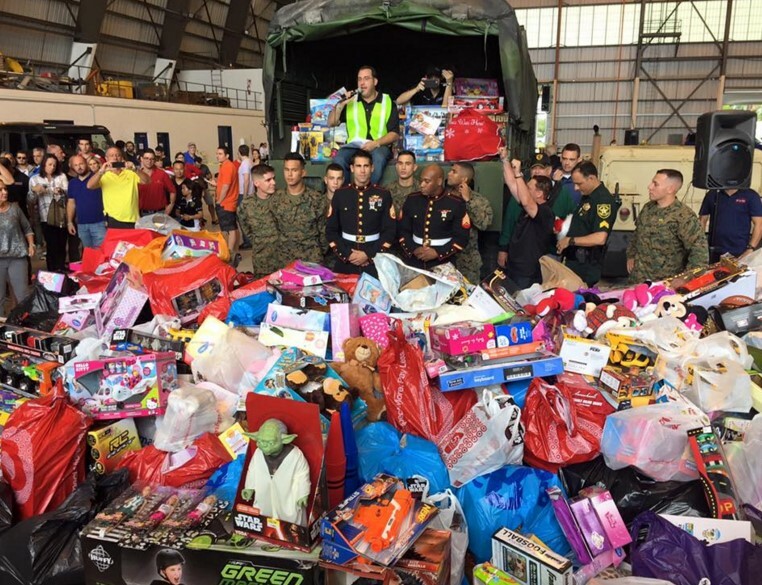 This entry was posted in News and tagged South Florida Toy Rally, The Collection, Toys for Tots, Ugo Colombo on December 17, 2015 by Ugo Colombo. Haute Living held its annual Art Basel blowout on December 4th. The evening started with an intimate collector’s dinner party sponsored by Hublot, Ugo Colombo’s The Collection and Perrier Jouët at Miami Heat star – and Collection brand ambassador – Dwyane Wade and actress Gabrielle Union’s waterfront home in Miami Beach. The sprawling entrance of the property was transformed into a magic garden, with a topiary maze featuring works by pop artist Mr. Brainwash aka. Thierry Guetta walls and flower wall by Olyve Flowers. Guests included Yankee slugger Alex Rodriguez, actor-artist Adrien Brody, the Heat’s Justise Winslow, Hublot CEO Ricardo Guadalupe, artist Romero Britto, Jorge Perez, Darlene Perez, Sara Colombo, and Ugo Colombo. “My wife and I are very thankful to be able to open our doors to you. It took us four years to build this house, we just moved in last year, so it’s great to host our first event here with partners Hublot and The Collection,” said Wade. Watch how we prepared for Art Basel by craning in the amazing Ferrari 488 Spider! Read more on Haute Living! This entry was posted in News and tagged Art Basel, Haute Living, Perrier Jouet, The Collection, Ugo Colombo on December 8, 2015 by Ugo Colombo.